UPDATE: With Google’s support to Nearby services, all Android 4.4(Kitkat) or newer devices receive Beacon notifications. Apple subtly introduced iBeacon at WWDC 2013 and it has been full steam ahead ever since, as brands continue to leverage this technology to enhance in-store experience. Reaching out to shoppers where they can be most influenced is the holy grail of marketing, and beacons make this happen. Thus it comes as no surprise that, beacons are heralded as the next hot, real-time proximity marketing tool. According to a recent Business Insider Intelligence study, more than half of the top 100 US retailers began testing beacons last year. The study also adds that, one out of three brands testing beacons are expected to be installed by the end of 2015, and 4.5 million active beacons will be set up by 2018, with 3.5 million of these in use by retailers alone. It’s surprising that in spite of all the hype around beacons, there is very little information on whether Android devices can act like, or interact with beacons. 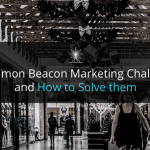 To leverage the potential of beacons to its fullest, brands must be aware of both its features and the factors that contribute to a successful proximity marketing campaign. If you too have been hunting all over for proximity marketing campaign success secrets that will help you ace your next campaign, you will find this new ebook ‘The A to Z of Proximity Marketing with Beacons’ handy. 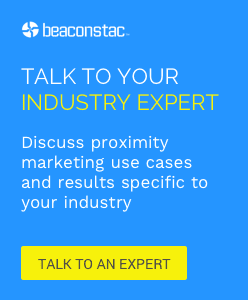 Retailers and brands today are abuzz with talk on beacons. But for all the current buzz, the technology is poised to really break out with the recent release of Android 4.3 and AltBeacon by Radius Networks as a new way to accelerate beacon adoption for non-iOS devices. While Apple’s iBeacon proximity system uses Bluetooth Low Energy, it can only communicate with iOS devices running on iOS 7. With Android users reported to outnumber iOS users by two to one, globally, this limits the market share offered to brands to a great extent. This is where Samsung’s Proximity platform comes into the picture. This location-based mobile marketing platform not only gives brands a larger market but also a deeper system level integration. What is even more exciting is that, it also wipes away the need for brands to have an app in order to leverage beacons. The platform provides an uber-application, Proximity Service app that sits at the device layer and helps detect a shared registry of beacons and then pushes messages through a shared service. In this post we will discuss how Android is fast catching up as the next go-to platform for beacons. Both iPhones and Android devices constantly listen for ID number signals broadcasted by beacons at regular intervals. In the case of an iPhone, the ‘listening’ happens within the operating system. The proximity-aware mobile app carries a list of ID numbers of all the beacons that have been activated and will associate them with their location. The OS has first order access to this. Once the device matches a beacon’s ID with the ID held in the proximity- aware mobile app, iPhone will then wake up the relevant application (even if it is closed) alone, when they are within the beacon’s range. On the other hand, Android phones don’t have a beacon system of this kind at the OS level. Therefore, for android users to interact with beacons, they need to have the corresponding app running on their phone (at least in the background) to scan for BLE signals. Thus, Android arguably has a less efficient, but more ‘open’ approach to Beacons. Beacons announce their presence by periodically broadcasting their ID number (which is unique to a particular beacon at a location). Mobile devices can then sense these signals and position themselves relative to the beacon, which in-turn adds to battery drain. Here, Android allows for scanning of all beacon signals in the background, while iOS devices restrict background search to a pre-specified set of iBeacon identifiers (UUIDs) alone. This particular approach has led developers to believe that beacons when used with Android devices will result in faster battery drain when compared to iPhones. However, according to a recent report by Aislelabs, a Toronto-based company offering in-store analytics and solutions for building mobile shopping experiences, Apple’s iBeacon framework actually perform better with Android especially when it comes to battery life. While Apple has made Bluetooth LE proximity easy to develop for and deploy, there are a number of limitations posed by Apple’s specifications. For example, Apple limits how much of a beacon’s packet can be used with the iBeacon SDK. (1) To define a robust specification for device transmission (the packets that a beacon sends) . It brings greater transparency to what a beacon transmits and how that data can be used by Android devices. (2) Provide developers with a new suite of tools and references that make it easier to develop apps that “listen” for beacons. For example, AltBeacon provides developers with a specification that is more flexible and can accommodate different types of proximity beacon implementations that can benefit by not being locked into a specific format, such as rigid identifier lengths and additional payload space for critical information. How else do you think Android is catching up with the Beacon buzz? Let us know in the comments below.